As its predecessor, the classic Thunderstruck, part II also revolves around Nordic god’s and more specific: the famous Thor. The essential difference between these two games is that this slot has instead of 9 paylines 243 ways to win. That’s a lot of reasons to be excited about Thunderstruck II, don’t you agree? 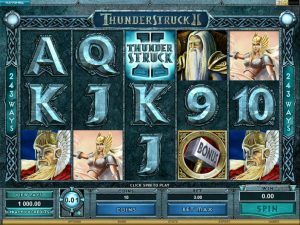 Microgaming has come with a smart predecessor of the Thunderstruck, with thunder hitting twice you can only imagine the kind of excitement that this slot brings. Microgaming has over 600 casino games, but yet Thunderstruck is one of the top 10 most played games. That might be explainable by the fact that Thunderstruck is that kind of game that is exciting yet simple to play. Microgaming also has its slots optimized to be played on mobile phone, which only adds to its popularity as you can now play from anywhere you like. Thunderstruck II works with 5 reels and 243 paylines on which you can play with up to 300 coins at ones (at a max of €15 per spin). 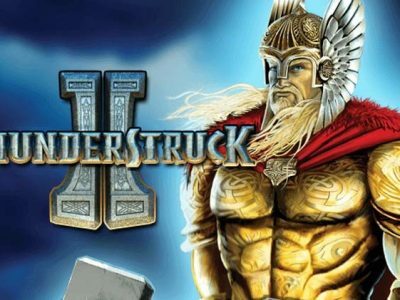 Like its predecessor, Thunderstruck II has the same theme of Nordic gods, which means that on the reels you find gods like Loki, Valkyrie and ofcourse the renowned Thor. By far the most important symbol is the Great Hall of Spins, which can land you lot of free spins granted to you by the Nordic gods. Other symbols to look out for in particular are the Thunderstruck II logo, which functions as the Wild symbol and substitutes all symbols except for Thor’s hammer. The Thunderstruck II doesn’t have a progressive jackpot but that doesn’t mean your prospects of winning are any less exciting. This well-balanced slot offers lots of opportunities to win and something even big wins through the many bonus features and unexpected spins.